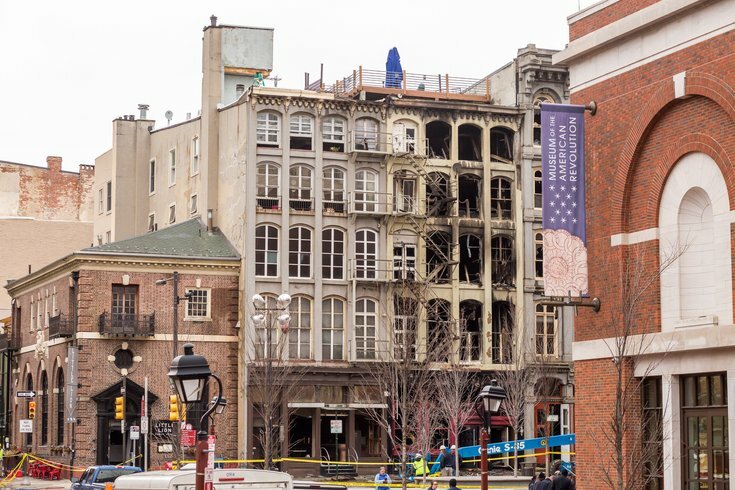 This was the scene Monday, Feb. 19, following the four-alarm fire that damaged buildings on the 200 block of Chestnut Street early Sunday morning in Old City, Philadelphia. City inspectors have determined some of these buildings are imminently dangerous of collapsing and they my have to be demolished. As the 200 block of Chestnut Street continues to recover from the massive fire early Sunday morning, officials are weighing whether to demolish the Old City structures that sustained the worst damage. Additionally, NBC10 has reported 13 animals were killed in the blaze, including nine cats and four birds. Several other animals were rescued but are now displaced, Red Paw Relief told NBC. No people in the buildings were injured or killed, and all totaled, about 160 residents and hotel guests were evacuated during the fire. Two firefighters suffered minor injuries. It took approximately 400 firefighters to out power the four-alarm blaze that began on the sixth floor of an apartment building at 239 Chestnut St., located across from the Museum of the American Revolution and sharing a wall with the Best Western Plus Independence Park Hotel. The Department of Licenses and Inspection said on Monday the building was “imminently dangerous” and called on the building’s owner to remove its outdoor fire escape in the interest in salvaging the building's structural sustainability. The area of Chestnut Street between Second and Third streets remains closed to traffic Monday but opened for pedestrians at 10 a.m. The Museum of the American Revolution also re-opened at that time after closing Sunday to house some evacuees. Numerous nearby restaurants and businesses also were damaged by the fire, including the Little Lion, which sits at the corner of Third and Chestnut Streets. The restaurant closed Sunday; there's no word yet if it can reopen Monday. Cocktail bar Gina’s 45 and 24-hour eatery Revolution Diner also were severely damaged, and Capofitto Pizza + Gelato announced on social media it would remain closed Monday. Traffic and SEPTA are affected by the fire, with SEPTA bus routes 17, 21, 33, 42, 48, 5, 57, and 9 detoured. It’s still unknown when those local businesses can expect to reopen, and whether the building and neighboring hotel will be salvageable. The Philadelphia Fire Department continue to investigate and has not released a report on the cause of the fire.